Originally published in 1952 as Kansas Geological Survey Bulletin 99. This is, in general, the original text as published. The information has not been updated. An Acrobat PDF version (27 MB) is also available; plates available separately. Deposits of Pleistocene age underlie much of the surface of Kansas. They contain more than 60 percent of the State's ground-water supplies, most of our sand and gravel and volcanic ash, and important deposits of ceramic materials. 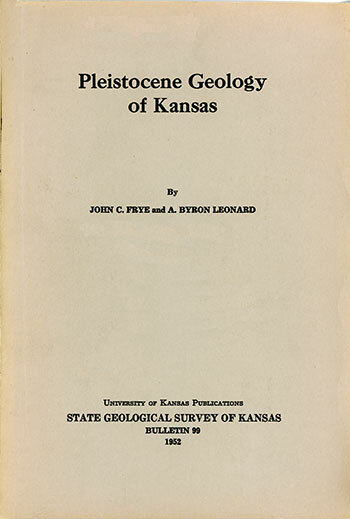 This report presents data on the general geology of Kansas Pleistocene deposits and is intended to serve as background for work by the Geological Survey and others on the utilization of these many materials and as an aid to soil scientists in their study and mapping of surface soils in Kansas. A brief summary of the geologic processes that have produced the Pleistocene deposits is followed by a review of principles governing the classification and correlation of sedimentary strata. Stratigraphically, Kansas is the transition region joining three provinces: (1) the area of continental glaciation to the northeast, (2) the area of fluviatile and eolian deposits to the west and southwest, and (3) the Ozark province to the southeast. Kansas possesses representative deposits of each Pleistocene Stage with glacial deposits of Nebraskan and Kansan Ages. The Kansan Stage is appropriately the most extensive in Kansas, and the Wisconsinan Stage is characterized by extensive loess deposits. All Pleistocene stages in Kansas contain abundant faunas of fossil mollusks and more than 100 species are listed from more than 200 localities. A review of the drainage history of Kansas describes the progressive evolution of the present stream pattern from a general southern drainage that existed in the central and west during early Pleistocene time. The existing landscape of Kansas is a result primarily of geologic processes operating during Pleistocene time. Web version August 2005. Original publication date Nov. 1952.